Interested in participating in the next Outback Bowl Halftime Show? Reserve your group's spot today! Be part of an iconic New Year's celebration during the Outback Bowl Coca-Cola Halftime Show! Each year, more than 2,000 young performers from across the United States come together to march, dance and perform at Raymond James Stadium, in front of 65,000 fans eager to cheer them on. The Coca-Cola Halftime Show kicks off with performances by the college marching band and dance teams of the two schools facing off in the Outback Bowl. Following, is the famed mass band performance, featuring 30 high school bands and more than 300 dancers in mesmerizing routines. 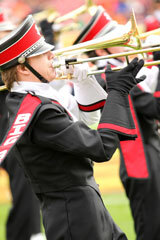 For the participating high school bands, the Outback Bowl Music Festival is a four-day event comprising performances and competitions. Other festivities include clinics with renowned professionals, a marching performance in the Outback Bowl Parade through historic Ybor City, an awards ceremony and a memorable New Year's Eve celebration at Busch Gardens in Tampa Bay. Since the first Outback Bowl Halftime Show, more than 84,000 performers from 447 high school bands, representing 32 states and Canada have performed.